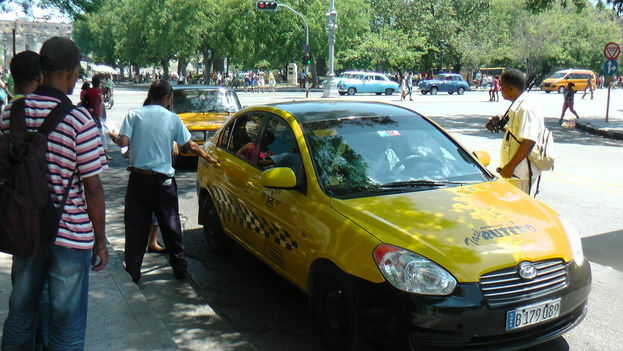 In Havana, around 90% of self-employed workers with a license to provide transport, engage in passenger transportation. A total of 6,119 private holders of transport operation licenses have been summoned to take part in the experiment, which establishes a new classification of routed shared taxi service — unregulated and high-comfort — versus the “classic” mode, according to the authorities in charge of implementation. In Havana, around 90% of self-employed workers with a transport license dedicate themselves to passenger service, which is recognized as “complementary, alternative and necessary” to the service provided by state-owned companies. Private carriers, mostly owners of US-made cars from the ’40s and ’50s popularly known as “almendrones” — after the ‘almond’ shape of that era’s vehicles — have been summoned as of Monday to appear at the municipal offices that oversee these license holders. To obtain a license to operate transport, the license holder is required to have a contract to acquire fuel and to have a bank account. Among the main incentives is that the contract allows the purchase of fuel at lower prices — a savings of between 2 and 66 cents on the dollar per liter depending on the type of gasoline. The requirement also is intended to stop the black market purchase of stolen state fuel. Another advantage offered to the private carriers that benefit from this initiative is the ability to acquire tools, parts and accessories for their vehicles in a wholesale market at 20% lower prices. The new system, which establishes 26 terminals and 23 associated routes, will be developed over a period of four months in Havana and will involve license holders with cars, SUVs and minibuses with capacities of between 4 and 14 passengers. Later, the experiment will be extended to the western provinces of Artemisa and Mayabeque and within a year to the rest of the island. Vehicles of greater size and capacity will also be incorporated, in accordance with what has been explained by those responsible for the scheme. The Deputy Minister of Transport, Marta Oramas, said recently that the measures taken seek a balance between “the interests of the population, associated with more affordable prices and safety,” and those of the carriers, “so that they do not see their incomes diminished and lose access to facilities,” for fuel and tools, parts and accessories. “The State must guarantee a stable, orderly and quality service,” said the official. These regulations are part of a package of 20 measures ordered by the Cuban government that will go into force on December 7 to “reorder” the growing private sector, with the aim of grouping and expanding the profile of permitted activities, as well as restarting the issuing of licenses, which has been on hold since August of 2017. As of August, more than 593,000 private workers were registered in Cuba, a figure that represents 13% of employed persons, according to updated data from the Ministry of Labor and Social Security. Next Next post: "We Are Going to Paralyze Havana"